May 31, 2016 — Downtown Alameda Business Assn. Tucker’s Ice Cream has been an Alameda and Bay Area favorite for over 75 years. Generations of customers have been enjoying their rich and full-flavored old-fashioned “super creamed” ice cream, along with yogurt, sorbets and sherbets, fresh fudge, ice cream cakes, Cho Cho’s, and Tommy Tuckers. Tucker’s Ice Cream is SUPERCREAMED! Made the old-fashioned way in batch freezers with only the freshest ingredients available — real fruit and nuts are hand picked for taste and texture and carefully blended with the finest flavorings to produce their trademark super creamed ice cream. It all began in the spring of 1941 when Marshall Tucker and his wife Verda left their Chico, California home to establish an ice cream business in the city of Santa Cruz. Taking a break on the journey South, they stopped for lunch and ventured into the city of Alameda. What they found here was a unique and warm community that would make an ideal home to raise their children and build a business. May 11, 2016 — Downtown Alameda Business Assn. Celebrate the birth of our Island City with a free public art event open to all ages. On May 21 and 22, audiences will be taken on a guided journey to four sites along the water’s edge to experience art, dance, music, and tales connecting them to Alameda’s rich maritime past. The half-mile walking route follows Alameda’s historic Waterfront Trail, starting near the foot of the Fruitvale Bridge and ending at the public walkway near the Park Street Bridge. More than two dozen performing and visual artists will be contributing to the event. Actor Ed Holmes will share stories of immigrants drawn to the city’s booming maritime trade while the audience is surrounded by historical and present-day images of the estuary. Muralist Mark Lewis Wagner will honor the immigrants who built the tidal canal by creating large-scale drawings on sail cloth that will become a backdrop for choreography by Kim Epifano and music by Maze Daiko. Tour times on Saturday, May 21 and Sunday, May 22 are 10:30am-Noon, 12:30pm-2:00pm, and 2:30pm-4:00pm. Participation on each tour is limited to 100 people, with 50 spots per tour available for advance reservation. Plan to arrive 30 minutes early to park and register. The event is conceived and directed by Rhythmix Cultural Works Founder and Artistic Director Janet Koike. In conjunction with Island City Waterways, Rhythmix Cultural Works presents “Island City Waterways: Waves of Inspiration” is on display through June 29. This three-person exhibition investigates Alameda’s industrial landscape along the water’s edge. The featured works are by environmental painter Ginny Parsons, photographer Pons Maar, and industrial designer and artist Marc Ribaud. All three artists reside in Alameda. The library maintains a rich array of historical materials including books, pamphlets, and clippings relating to Alameda’s history — some more than 100-years-old. The Alameda Collection reflects the city’s historical and cultural development. When perusing the shelves, you’ll find non-fiction books based in Alameda, biographies of Alamedans, and materials written by Alamedans. Exhibits at The Alameda Museum celebrate and preserve the colorful past of this unique island city. You’ll find a number of maritime stories among the displays of early life in Alameda: history of Alaska Packers Association, a 1892 model of a tall-masted sailing vessel, a model of the ferryboat “Sacramento,” and more. May 28, 2013 — Downtown Alameda Business Assn. Update: Happy retirement to Kit after 16 years of service! The new owner, Tony Yu, will officially take over on April 2, 2015. Among the changes that have been taking place in the Park Street Business District this past month, people have been surprised to see that Pampered Pup has been closed for a few weeks. Many have asked what is happening to Alameda’s iconic restaurant… is it closing? has it been sold? is it being replaced? In following up on these questions, we were sad to learn of the recent passing of the owner, Pak. His son is currently in town and explained that the family is making some upgrades to Pampered Pup as a tribute to his father’s work. Sam says the changes they are making are the things that his father had always wanted to do, but just didn’t have the time or the energy. Recognizing that “The Pup” is a landmark on Park Street, Sam says the changes will be in keeping with the existing retro character of the hot dog place. Visits have been made to the Alameda Museum to find old photos, ensuring that design updates are authentic to the original style. June 28, 2012 — Downtown Alameda Business Assn. 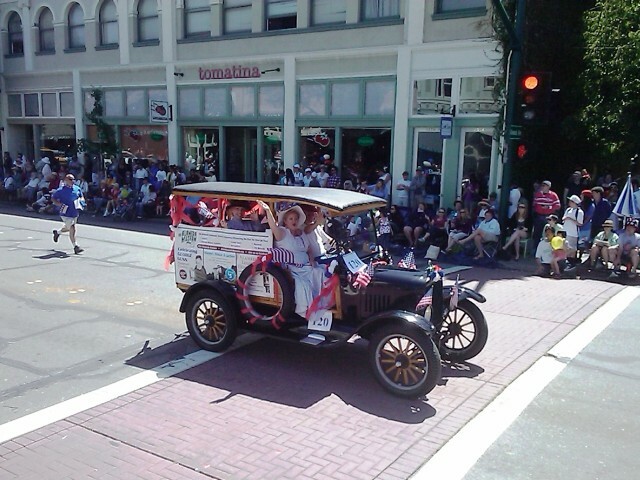 Fourth of July is coming up and in Alameda that means a day to head downtown to view one of the longest Independence Day parades in the nation. Stretching from Park Street to Webster Street, the Alameda Mayor’s Fourth of July Parade boasts over 170 “floats” and 2,500 participants that travel a 3.3 mile route. In addition to performers that come from the Bay Area, many local businesses, schools, and organizations participate in the parade. Entries include hand-decorated flatbeds, antique cars, marching bands, dance troupes, cheer leading squads, horses, bicyclists, musicians, and clowns… to name a few favorites. With so much to see, where’s the best place to view the parade? Our answer: Park Street, between Lincoln and San Jose. May 30, 2012 — Downtown Alameda Business Assn. Alameda Theatre & Cineplex — Take the Magic With You! School is almost out for the summer and there’s good reason to head to the local movie theater in the Park Street Business District. Alameda Theatre & Cineplex has created two different movie series for the months of June, July, and August. Maybe you would like to take the kids to a morning Family Movie Series that features some of the most entertaining children’s favorites released within the past few years. Or maybe you would like to indulge in the late-night openings of this summer’s most anticipated blockbuster films by attending the Midnight Movie Series. 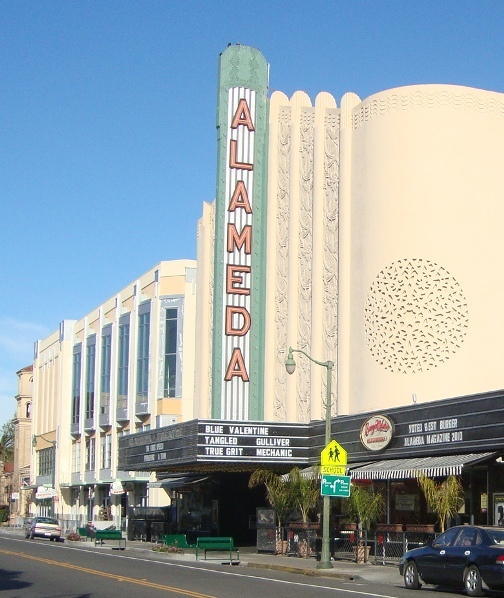 On Friday and Saturday nights, Dave May hosts “Alameda’s Got Talent.” The mini-contest precedes the evening movie in the Historic Theatre and showcases some of Alameda’s hidden talent. Interested in performing? The Theatre takes sign ups at the Box Office.